At this point, is there anything that Les Claypool hasn't done? After fronting alt-metal legends Primus for 30 years, recording with the Police's Stewart Copeland and Phish's Trey Anastasio, releasing a live album covering the entirety of Pink Floyd's Animals and writing the themes for South Park and Robot Chicken, Claypool has decided to form an Americana duo. 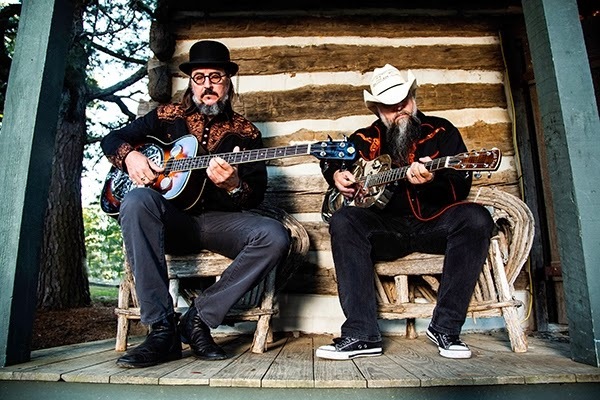 The Duo de Twang's debut,Four Foot Shack, finds Claypool and long time collaborator Bryan Kehoe reinterpreting Americana classics, modern songs and tracks from Claypool's own discography using just one bass, one guitar, and a whole lot of foot stompin'. "This record represents what I personally listen to these days," Claypool tells Rolling Stone. "Guys like Johnny Horton, Jerry Reed and Vernon Dalhart are the soundscape of my world as I'm boiling up crab in the backyard or working on my old Chryslers, so the notion of 'twangifying' my tunes seemed like a damn good idea." Across the bouncy album, Claypool and Kehoe pay respect to the history of bluegrass, but keep their tongues firmly planted in their cheeks. Of course, Claypool's Zappa-meets-Devo humor permeates the record. The cheerful riff on Horton's "Battle of New Orleans" is given a lively, loving interpretation. By contrast, Alice in Chains' "Man in the Box" is given a "Rawhide" makeover. As for the Bee Gees' "Stayin' Alive," Claypool's croaking delivery of the song's famous "Ah! Ah! Ah! Ah!" refrain needs to be heard to be believed. Four Foot Shack is out February 4th. The Duo de Twang will be on tour starting in late February.